$4,000 was given to the Richmond Headstart Project as part of the club's commitment to Young Children Priority One. $350 was contributed to the Crusade for Children campaign. This same amount will come back to Eastern Kentucky University to work with children in our community. $100 was contributed to the Richmond Children's Theater to assist them in their productions. $1,000 was given to Habitat for Humanity to help build another home in our community. This was presented at our June 13th meeting to the local director of Habitat for Humanity. He said the $1,000 contribution (since homes are interest free to the low income families living in them) represented one year of occupancy for a family holding a 40 year mortgage. Kiwanis invested $1,500 in making the Kentucky Special Olympics even more special for participants and their parents. More than 600 participants were served by Kiwanis volunteers Brenda Blankenship and Phyllis Adams. More than 400 Polaroid photos were made of participants with special price for film being made by the local KMart. Items distributed to participants included sunglasses, sun visors and stress balls. The fire department made an engine available for participants to pose on for photographs. Thanks to the fire department and to KMart for their help. $200 was contributed to the Richmond Younger Women's Club to support the Junior Miss Pageant. 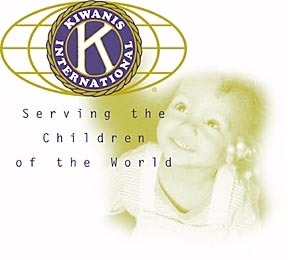 Kiwanis is a Platinum Patron for this event. Lea Cornelison, President of the Model Key Club, was the recipient of a $500 scholarship for her exceptional scholarship and her leadership of the Model School Key Club. The award is designated the George Brown Scholarship in recognition of a longtime Kiwanian and professor in the Department of Technology at Eastern Kentucky University who died this earlier this year.